Handcrafted from solid wood by experts in family mealtimes, this South River Mission High Chair makes the ideal addition to the dinner table. The woodworkers who craft this piece have big families of their own, and they know exactly what it takes to make mealtimes happy, memorable, and safe for everyone in the family. A big part of these meals is making sure that everyone, from the youngest to the oldest, has a seat at the table - and that's what this high chair does best. Every piece of the Tall Mission Wooden High Chair is finished by hand, giving the piece the kind of effortlessly smooth and glossy feel that only hand-sanding can achieve. This attention to detail combined with the chair's solid wood construction and heirloom finish mean that it promises to stay strong and beautiful through year after year of stray peas, spilled juice, and creative eating, with the tray's lip offering additional protection against toddler-led food messes. 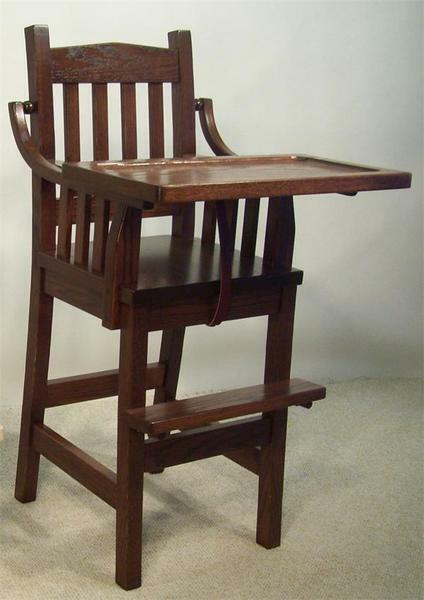 Use the menus above to create your ideal South River solid wood high chair. If you run into any questions at all, please don't hesitate to give us a call or send us an email - we could talk about this instantly classic chair all day.